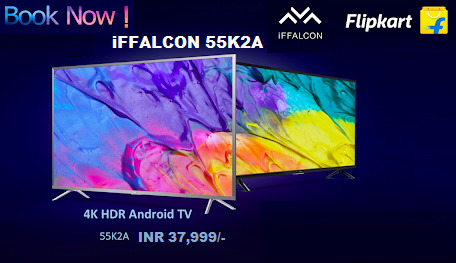 Home 4k smart android tv gadgets and appliances google certified android smart 4k tv iffalcon 55k 2a tv iffalcon tv days iFFALCON And Flipkart To Offer iFFALCON 55K2A – A 55-Inch, Google-Certified 4K TV – At Just INR 37,999 As Part Of ‘iFFALCON TV Days’! iFFALCON TVs come equipped with several top-of-the-line features. Users can avail endless and extensive streaming of Google services and can also push their favourite entertainment content from their mobiles to their TV screens through in-built Chromecast. Cutting-edge audio and HD video technologies enable high-quality visuals, precise image reproduction, and a rich, clear, and powerful surround sound for an immersive and engaging entertainment experience. All iFFALCON TVs also come installed with certified Netflix, further expanding the entertainment choices available to users.